Several years ago I came up with an idea for a worksheet to help my clients lower the stress and frustration they felt in their daily lives. As a Santa Barbara therapist, I’ve seen my clients gain good clarity and confidence from using this worksheet, and now I’ve decided that it’s time to share it with a wider circle of people. We can all benefit from learning new ways to create a little magic for ourselves! 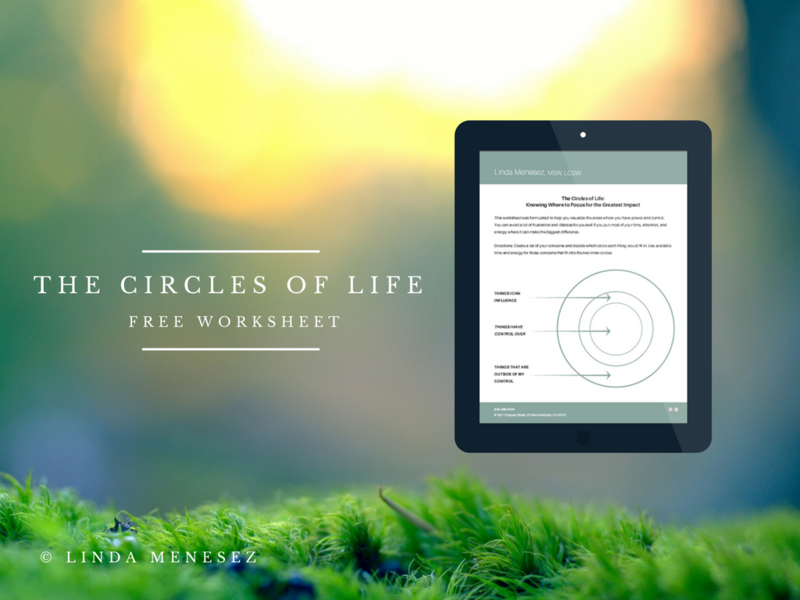 The worksheet I created is called “The Circles of Life.” You can download it for free by clicking HERE. So often we get completely bogged down trying to change something we have absolutely no power to change. It’s similar to being in a car that’s bogged down in the mud or sand. Pressing hard on the gas pedal does nothing but use up gas, and get us more stuck. It’s so helpful to know where we have control. When we know that, we can focus our thoughts, time, and energy where it really counts. We can use our power effectively. We aren’t spinning our wheels, getting nowhere! If you look at the worksheet, you’ll see that there are 3 circles, of graduating sizes. The largest circle represents the “Things That Are Outside of My Control.” You would put things in that circle like weather, traffic, news, politics, strangers’ behaviors, etc. It’s the biggest circle, because there are so many things that we have no power to change. When we allow our minds to ruminate on anything totally out of our control, we feel powerless, frustrated, depressed, anxious, and lots of other not too comfortable emotions. There’s nothing about this that helps us to feel serene! The next circle, going down in size, is the one representing “Things I Can Influence.” We can’t control them, but there’s a good chance that we do have some impact. For example, being friendly and respectful to others increases the chances that they’ll treat us the same. And even though we can’t control who wins elections, our decision to vote gives us some influence over the outcome. Another example might be something like your physical comfort. While we can’t control the weather, we can dress accordingly, and influence how much the cold or heat bothers us. We can impact many things by our actions and choices! The smallest circle is the one representing “Things That I Have Control Over.” These are the thoughts we focus on, and the decisions we make. It’s true that we don’t have the power to control all of the thoughts that come to our minds, but we do have the power to choose whether or not to allow them to stay. Thoughts come and go. What we choose to linger on is a big part of what creates our reality! Our moment-to-moment choices are powerful! That’s where we step out of feeling stuck, and instead find our zest for life. Knowing that we can choose how we view, and respond to, different situations is very freeing. We have options! We don’t have to immerse ourselves in heated discussions with anyone. We can simply walk away. We don’t have to stay in a job we dislike, or in a relationship that is hurtful. We can choose self-care over self-neglect. We can set healthy boundaries. We can live our lives in integrity. We can choose courage over fear in so many areas of our lives. We have so many different daily choices that are really meaningful! Use this post and the worksheet as a starting point. Get out some paper and a pen. Make three lists to correspond with the three circles. Each person will have unique lists, because each person is unique. Go back to your lists as often as you need. Add new things. Subtract any that no longer seem pertinent. When you find yourself stuck tight on some worry or frustration, think about which circle it would be in. If it would belong in the circle of “Things I Have No Control Over,” learn to let it go. There’s nothing to be gained by focusing on it. Instead, turn your thoughts to your list of things you can control. That’s where you’re powerful! If you need further explanation, or some support in making this work well for you, please feel free to contact me. We can set up an appointment to discuss where you’re feeling stuck, and how I can help guide you forward. I am located in Downtown Santa Barbara, and support individuals and couples throughout Santa Barbara County. Now, Start Creating Your Own Circles of Life Magic! ← Campaign Overload, and the Stress It Brings! Thank you for offering this free PDF. I downloaded and saved it to my computer desktop. This is so helpful to me personally and professionally. I love your blog, I recommend it to so many people! Thank you for your kind comment, Lorrie! I’m delighted that this worksheet felt valuable enough for you to save it to your computer desktop, where it will be readily available. We can all use some assistance in clarifying our thoughts, and easing our decisions during challenging times. Knowing how to recognize and utilize our power and control makes life much more peaceful and enjoyable. I’m so happy that you enjoy my blog, and that you share its existence with others! Thank you for letting me know. Thank you for this worksheet and your wise words. I think putting pencil to this paper will help me sort out some things. I’m glad that this worksheet looks like it will be helpful to you, Amy. Thank you for letting me know! I appreciate that.